Dark ocean needs a lighthouse: Why Bangladesh Govt is Blocking Youtube and eSnips? Why Bangladesh Govt is Blocking Youtube and eSnips? Bangladesh Govt is using cheap firewall tricks to block Social Media sites for Video, Audio and news site. Recently few leaked out Audio conversation between Prime Minister Hasina and Bangladesh Army were hosted in these sites. Instead of reporting to these sites Govt has banned them? Initially lot of people in Dhaka reported these problems and they thought it might be some server problems. 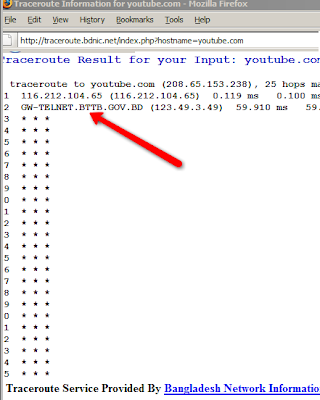 It shows all Youtube packets stops at GW-TELNET.BTTB.GOV.BD . Mango and BTCL (formerly BTTB) are the official IIGs (International Internet Gateway) in Bangladesh. 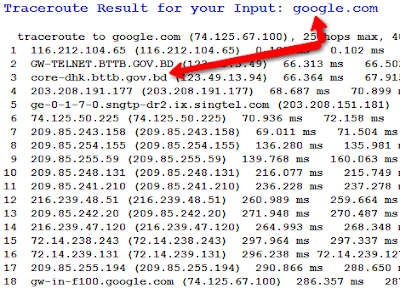 Now you can see Google request is reaching the server without any problem. If Bangladesh Govt thinks Internet is like Cellphone service then they are living in fools' paradise. There are many ways people can bypass the blockage. Earlier they tried to block Blog sites by blocking TCP ports in firewall but people redirected ports and made them working. 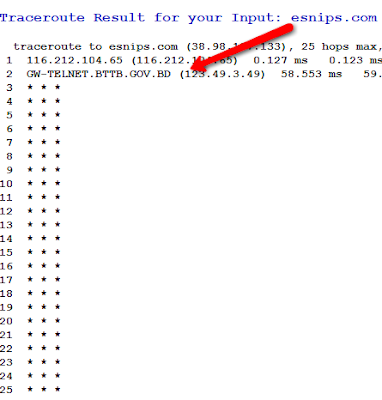 In this particular case anyone can use Anonymous proxy and bypass firewall! Interestingly, many of my friends told that they could watch Youtube because Govt has no control over VSAT based connections. Youtube, eSnips etc are very common and useful services. If Bangladesh Govt authority think any particular Audio and Video harmful for our society they could directly request Youtube to remove them. Such wild blockage is not only stupidity but also raises question about Govt's intention. I wish Bangladesh Govt understand the situation and remove any kind of blockage to these sites. BTRC Chairman confirms Ban of these sites. More.. Thanks to Rezwan of 3rd World view to refer this site. Mehdi published a list of few other blocked sites. Some users could successfully watch Youtube with P2P Proxy ClientTor/Firefox utility. Thanks A LOT to raise the issue. Ha ha ha.... Digital Bangladesh!!! Should this govt Ban Jamaat?